Did you know that it is James Bond Cinematic birthday today? 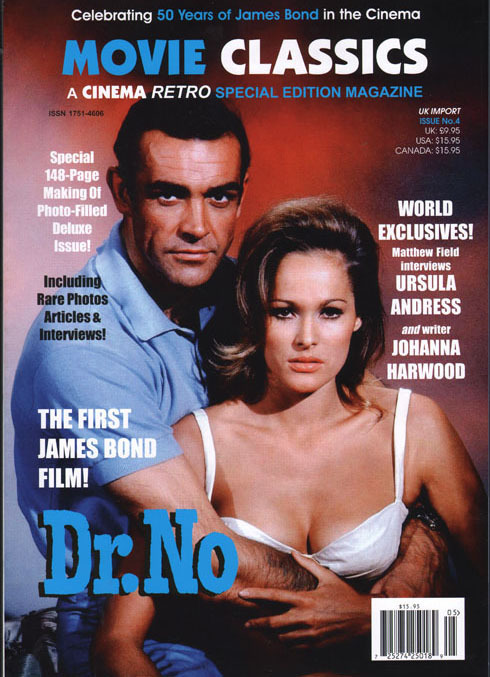 Back in 1962, Director Terence Young started shooting the first James Bond film titled Dr No on January 16, 1962. Today in other words. When I was in London in early December (you can read about that trip here) I spent a few minutes at The Cinema Store and added to the collection the Cinema Retro's magazine Movie Classics dedicating 148 pages to all there is to know about the making of Dr No. I am so happy that I bought this magazine becuase by having it in my backpack I had no problem letting the wife go inside any shop she wanted. I just sat down on a chair picked up the magazine and started reading. It is an fantastic collection of articles and photographs that I have never seen before. 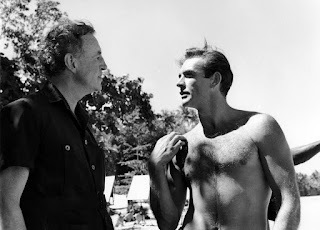 I can not stop thing about what went through the minds of people like Sean Connery, Cubby Brobboli, Harry Zaltsman, Terence Young and Ian Fleming. Was Fleming there on the first day of shooting since he stayed at his house GoldenEye at the time. I know he was there later as you can see on the photo to the right. I also must mention how bold I think it was to put "The first James Bond film" on the poster. But if the fim had flopped no one would have remembered it anyway. As most of you know Thunderball was supposed to be the first James Bond film but due to a court case with Kevin McClory about who actually wrote the story producers decided to go with Dr No instead with a script based on the novel released in 1958 with the same title. If you wish to read more about the court case you can do so here. You can order your copy of the magazine here or on Ebay for as little as £10.